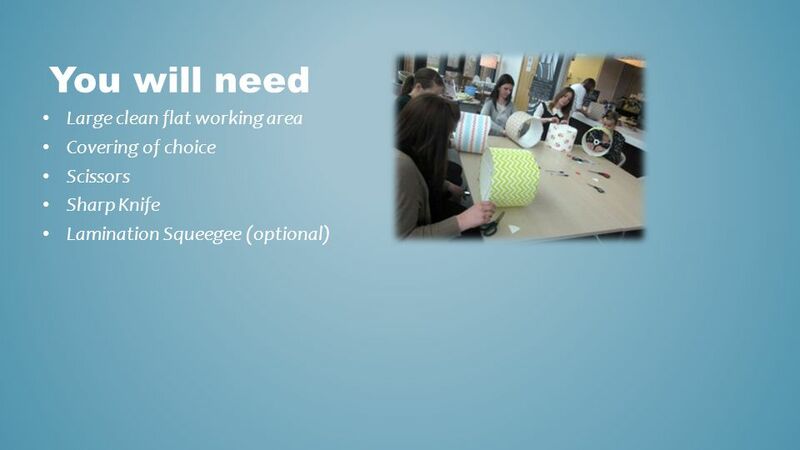 Group MAKING KITS Designed to deliver creative learning in your classroom or workshop. 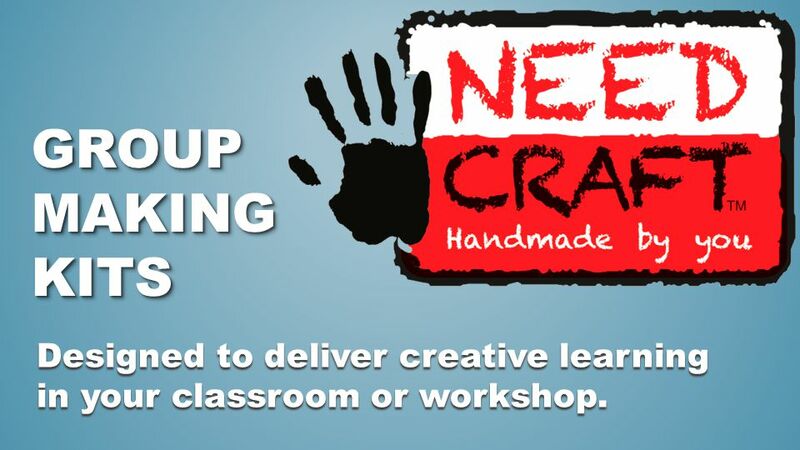 1 Group MAKING KITS Designed to deliver creative learning in your classroom or workshop. 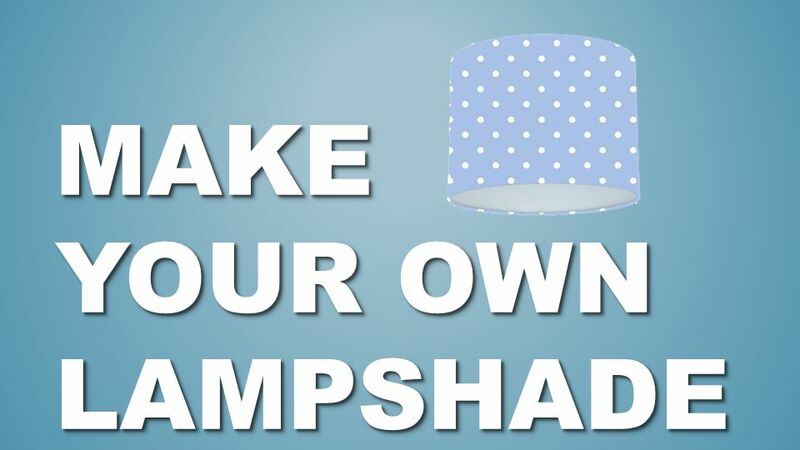 3 Handmade by you You will make a professional Lampshade from the covering of choice. 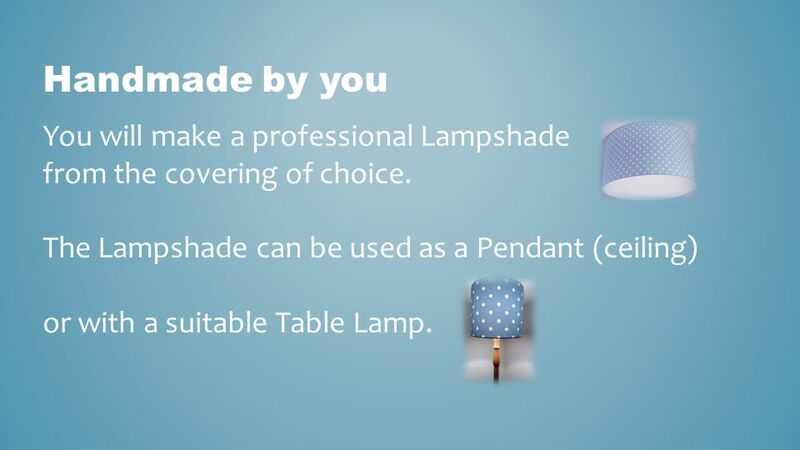 The Lampshade can be used as a Pendant (ceiling) or with a suitable Table Lamp. 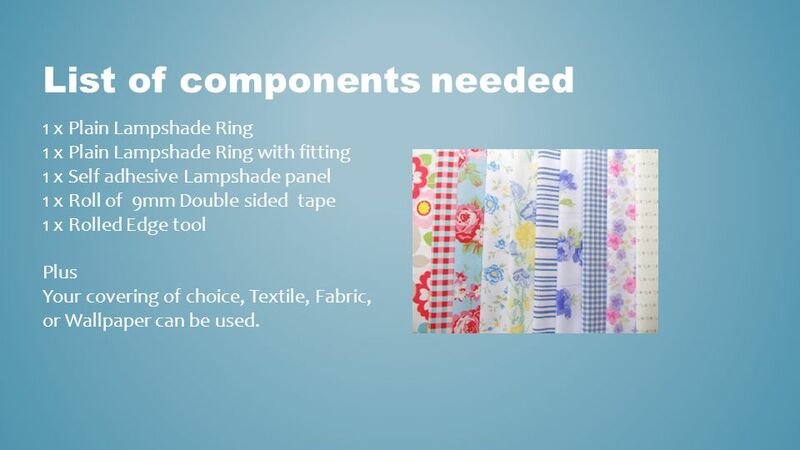 1 x Plain Lampshade Ring 1 x Plain Lampshade Ring with fitting 1 x Self adhesive Lampshade panel 1 x Roll of 9mm Double sided tape 1 x Rolled Edge tool Plus Your covering of choice, Textile, Fabric, or Wallpaper can be used. 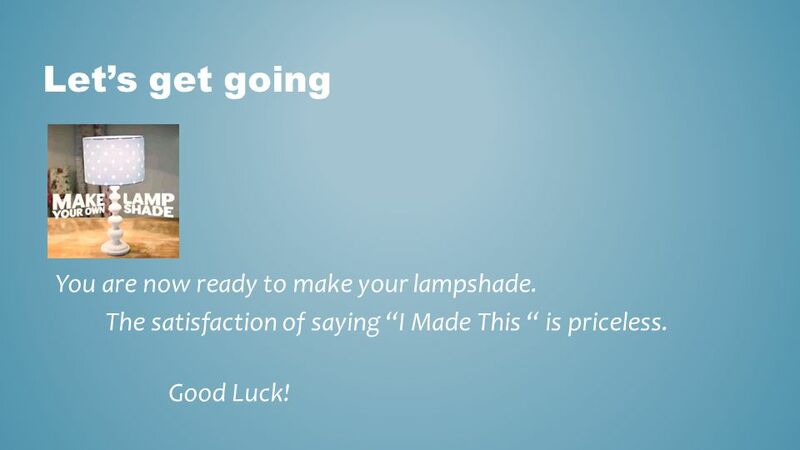 7 Let’s get going You are now ready to make your lampshade. The satisfaction of saying “I Made This “ is priceless. Good Luck! 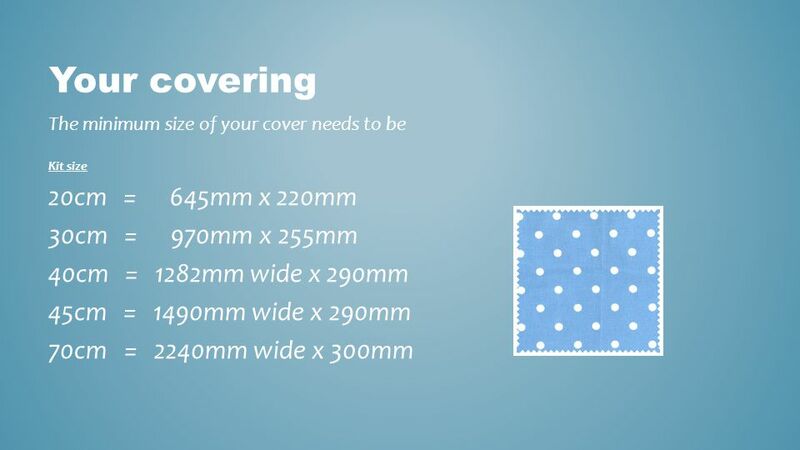 8 Prepare your covering Cut down your covering to size, it needs to be bigger than the lampshade panel. 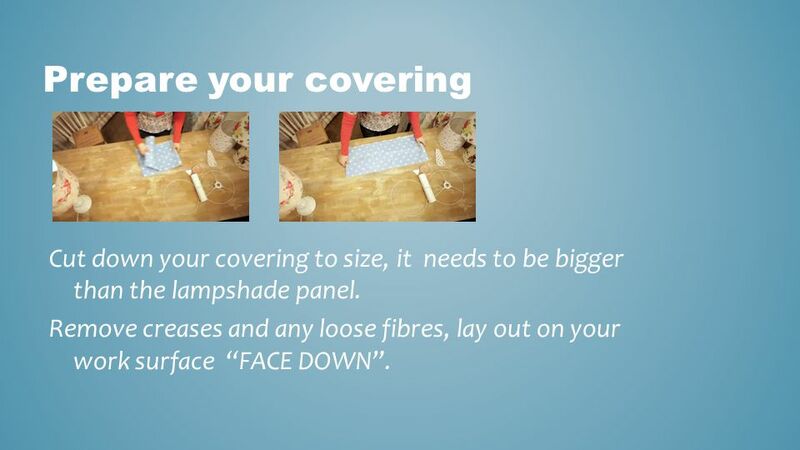 Remove creases and any loose fibres, lay out on your work surface “FACE DOWN”. 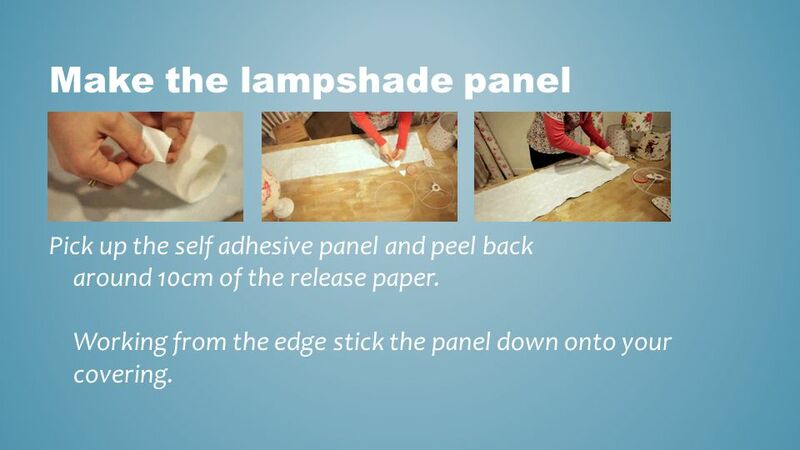 Pick up the self adhesive panel and peel back around 10cm of the release paper. Working from the edge stick the panel down onto your covering. 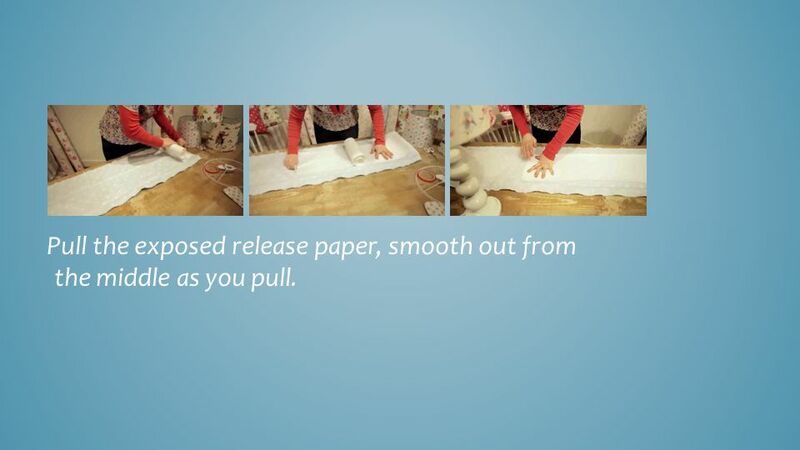 10 Pull the exposed release paper, smooth out from the middle as you pull. 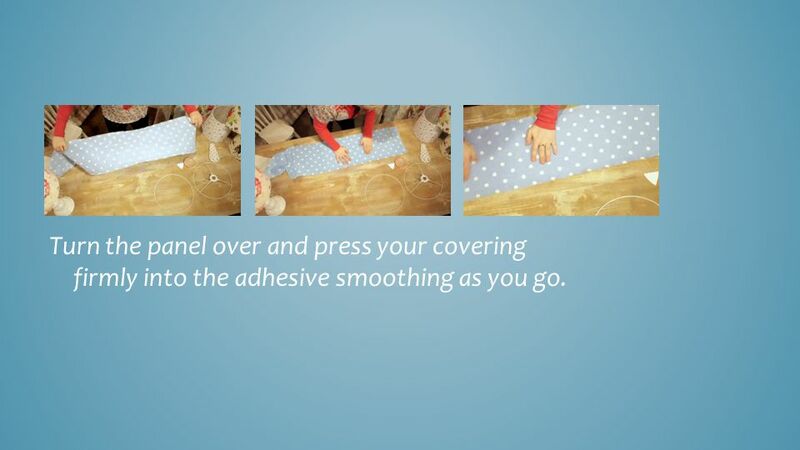 11 Turn the panel over and press your covering firmly into the adhesive smoothing as you go. 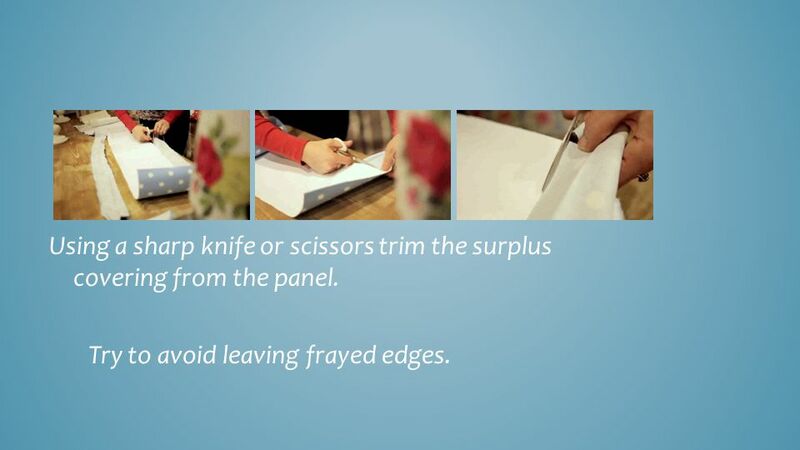 12 Using a sharp knife or scissors trim the surplus covering from the panel. Try to avoid leaving frayed edges. 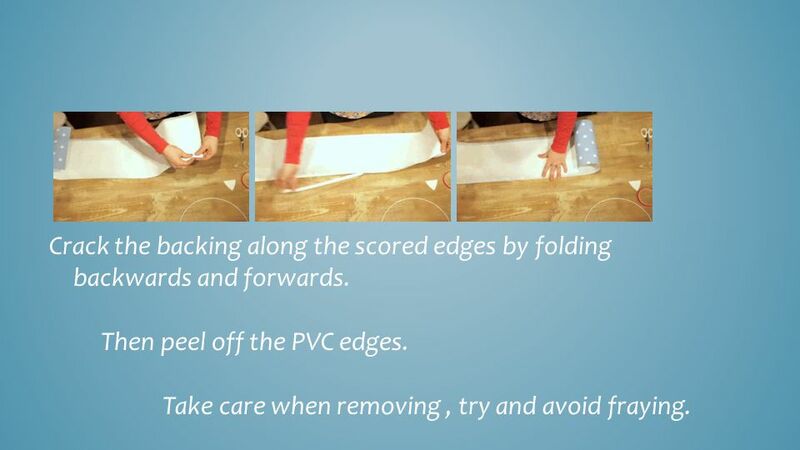 13 Crack the backing along the scored edges by folding backwards and forwards Then peel off the PVC edges Take care when removing , try and avoid fraying. 14 Apply a strip of the 9mm double sided tape to the edge of the panel on the PVC side. This will be used to join the lampshade together at the seam. 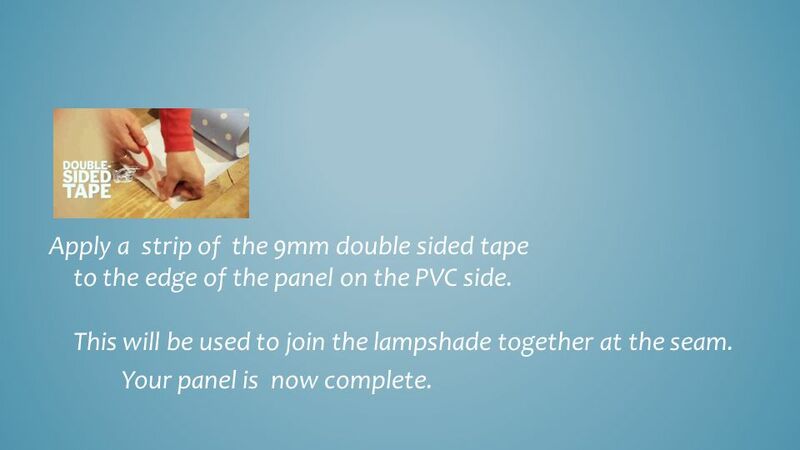 Your panel is now complete. .
15 Prepare the rings Apply the 9mm double sided tape to the outside of the lampshade rings. 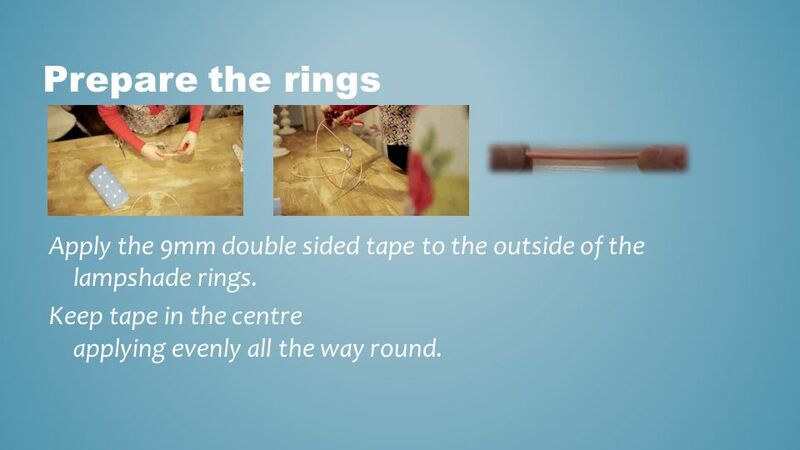 Keep tape in the centre applying evenly all the way round. .
Crunch the tape into the ring and smooth round. Remove the release paper from the rings The rings are now ready for rolling around the panel. .
17 Rolling NOTE: The Fitting ring must be inside the lampshade. 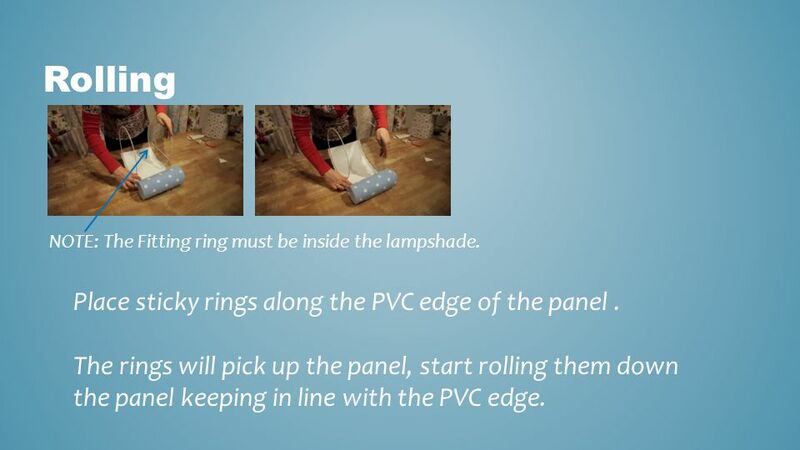 Place sticky rings along the PVC edge of the panel . The rings will pick up the panel, start rolling them down the panel keeping in line with the PVC edge. .
Keep going following the PVC edge. If you go out of line don't worry, go back! . When you get to the overlap remove the release paper from the double sided tape you applied earlier. Let the panels come together, position the join on your work surface and press the join hard from inside the shade. .
20 Snip Turn the shade fitting side up. Using your scissors snip the covering above the struts. So the covering can fit behind. 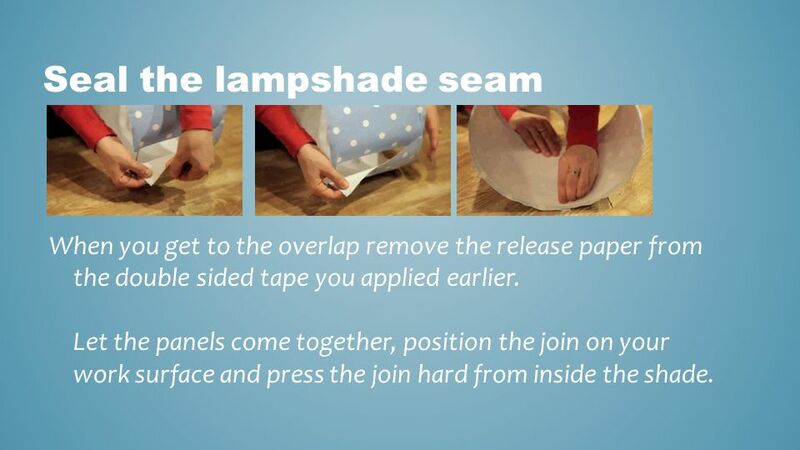 . .
21 Fold Fold the surplus covering inside the lampshade. Keep the covering stretched tight so it does not pucker. Tuck fabric into the ring ready for finishing. . .
22 Finishing Pick up the rolled edge tool. 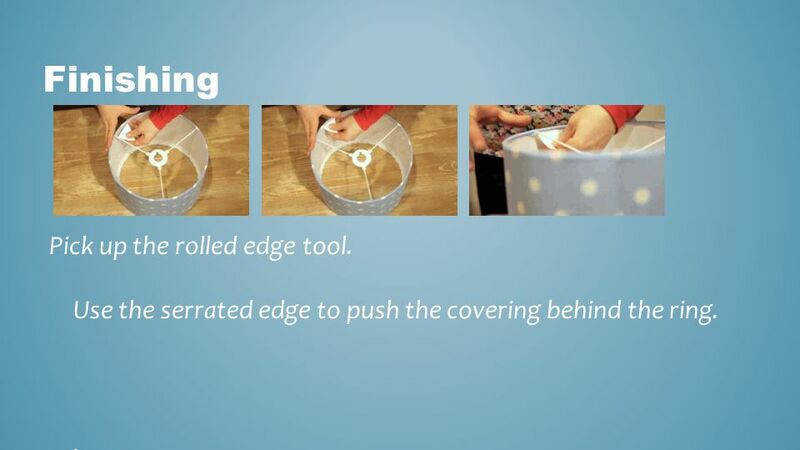 Use the serrated edge to push the covering behind the ring. .
23 Use the smooth side of the tool to finish the tucking process. 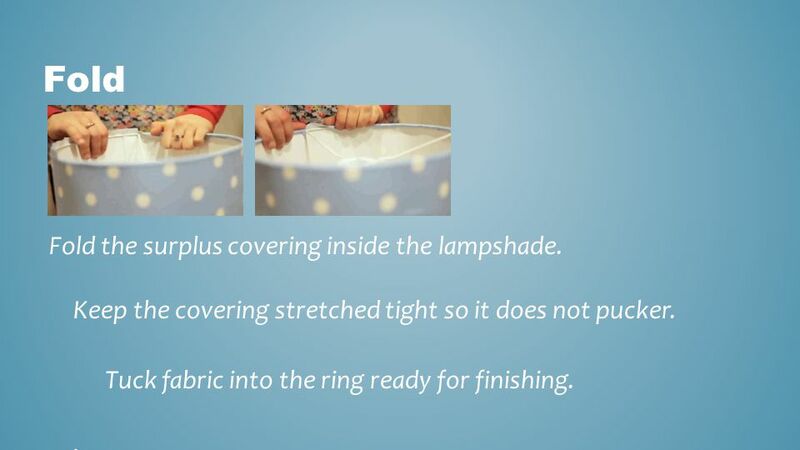 Place the tool behind the ring and run it round the whole lampshade. .
24 Complete You will now have made a professionally finished top quality lampshade that can be used as a pendant (ceiling fitting) or with a table lamp. .
Download ppt "Group MAKING KITS Designed to deliver creative learning in your classroom or workshop." Equipment for Assembly Fluke Multimeter 115 True RMS Glue Ring Jig Flathead screwdriver 60 Watt desk lamp HIOS Cl 4000 Electric screw driver Anti-static. Mask making Sculpture 1. Mask theme YOU MUST PICK FROM ONE OF THE FOLLOWING THEMES Design must be original !!! Animal Traditional culture Self portrait. Best Bread Rolls Fast Focaccia Perfect Pizza. Ingredients to make 6 bread rolls: 225g strong white plain flour, ½ x 5ml spoon of salt, 1 (6g) sachet of. Slab constructed cup Flatten a lump of clay into a long shape as you will be rolling out a slab long enough to wrap around a tube form. Note: finished. Stamped Slab Vessel with Handle(s). 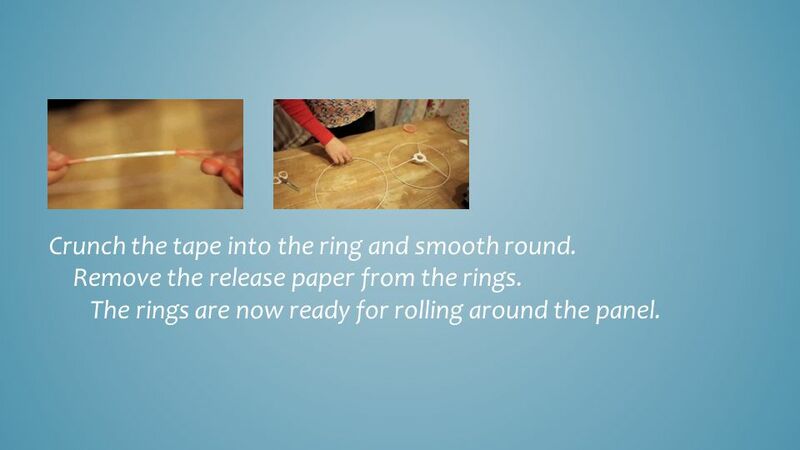 Create a paper template where you plan how you will use the stamps you have created. 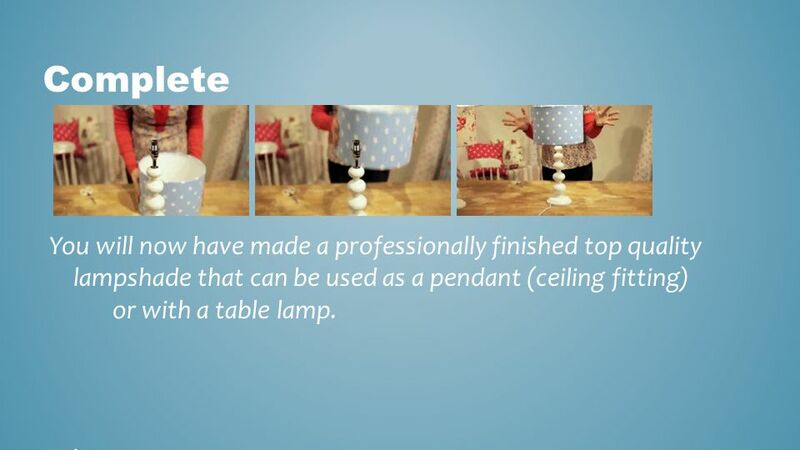 It will indicate the height and. Choosing Quality Apparel Apparel Development 2 Objective 3.01. 5cm fold line Square cushion: This refers to the two squares on the fabric Allow for front and back of cushion in measurements even though the fabric is. 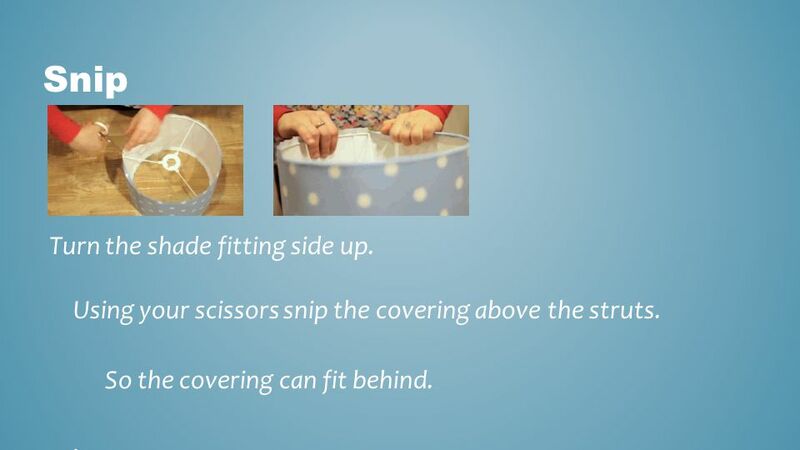 Sewing Basics Earning your Sewing License. 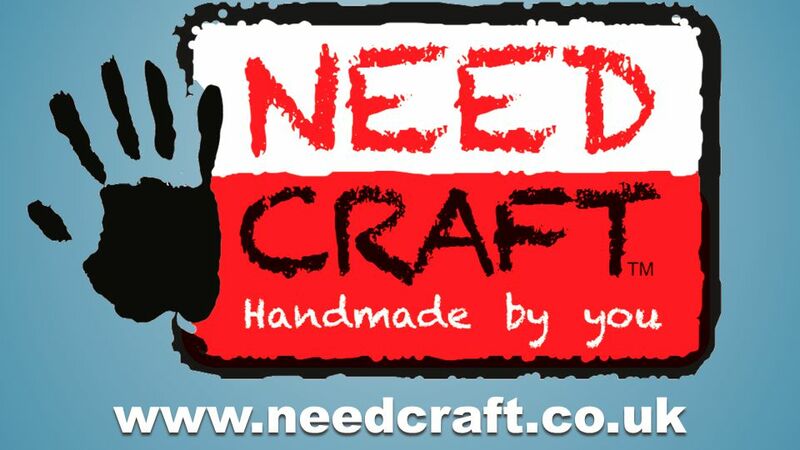 Why Learn How to Sew? Why should we learn how to hand sew? What are some useful applications from hand sewing? Pin Cushion Assignment HNC3CI Crowell Adapted from Fairy Face Designs. 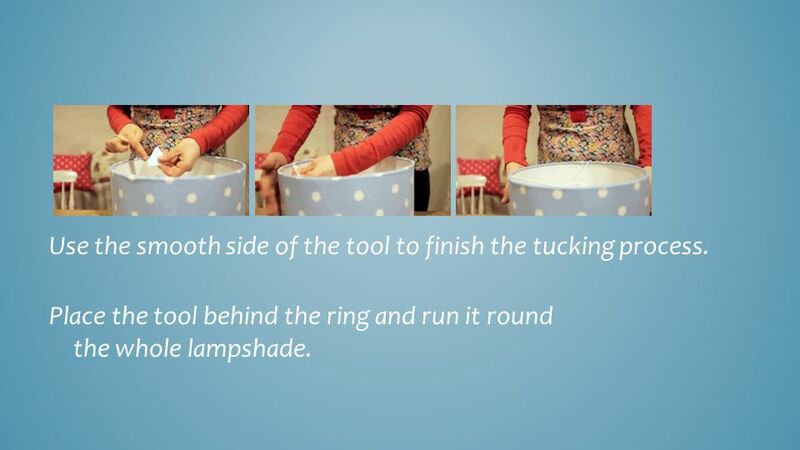 Solar Bake Off. 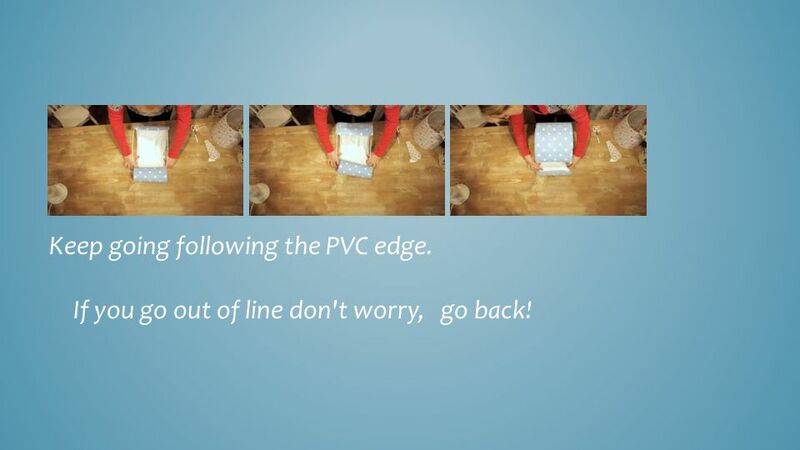 PROCEDURE 1.1 st person traces a flap in the top of the box. Use the ruler and marker to measure a 1½” border around the lid, on the. How to make a wearable pinhole camera Don Duggan-Haas, Museum of the Earth Materials:  Photocopy paper box  Tape:  Duct  Transparent  Electrical or. 1 14” 52” Garment 14” 21” 10” Fabric Arm Restraint Garment for 6-12 Month Olds You’ll need: Two pieces of lightweight knit overlock fabric (stretches one.